I made this card for my hubby for our Anniversary last week. He never clued in when he saw the handmade envelope I made to put the card in and left out on the computer station. He just asked "What's this? ", and I replied "You have to wait till fridayto open it and find out!" Perplexed till then. Oh, yeah, I already knew that" I say. "Oh, yeah, uh and it's our Anniversary - HAPPY ANNIVERSARY!" He finally clued in when he and his coworkers were discussing special days/events in their lives that fell on a 13th, and that day would sometimes fall on a FRIDAY the 13th. Usually he's the one that remembers and he makes me a handmade card or photo impressed luv mug - sweet stuff like that! 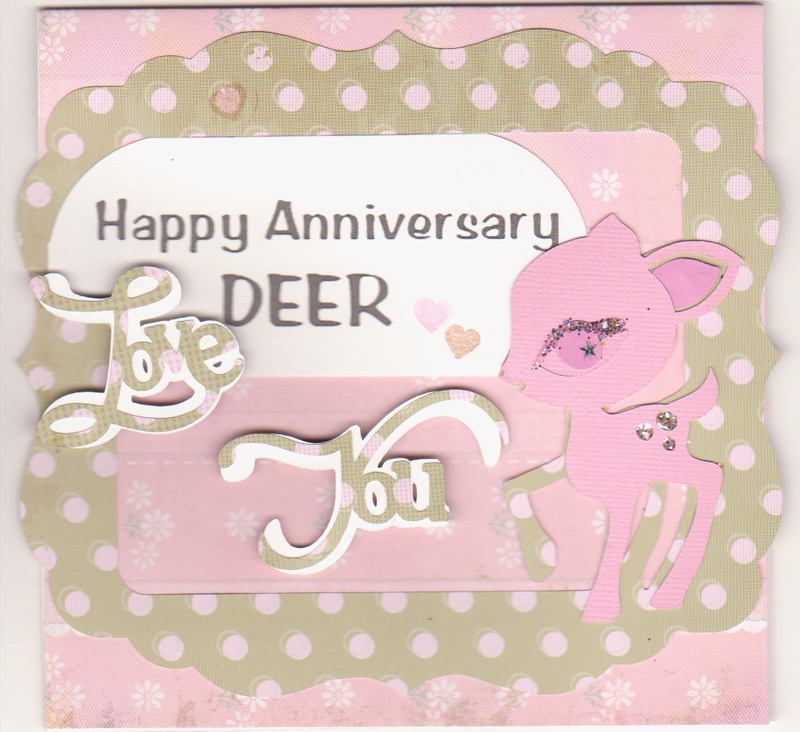 Using the Cindy Loo cartridge in my Cricut Cutter I made the deer frame, using pink paper with brown polka dot print and used the GYPSY design studio to tweak the size of the 2nd deer (overlay), using pink paper. It took a while to get to the right size, and when I found it I saved it for future reference. I have more card ideas for future projects using this image. The frame was adhered using 'sook wang' tape to printed cardstock with soft hues and dainty daisies. I added a line of glitter to the upper lid of the eye for little extra sparkle and a tiny star that was in the glitter was used to highlight the eye. I created the sentiment on my computer, printed it out and adhered it too with 'sook wang' tape. The "LOVE YOU" sentiment was included in the GYPSY hardware. Check back to my blog for more of this adorable deer.